Kinsella on Liberty Podcast, Episode 049. 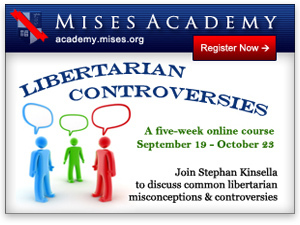 This is lecture 5 (of 6) of my 2011 Mises Academy course “Libertarian Controversies.” This talk covered “Controversies and Conundrums,” such as monarchy vs. democracy, discrimination and diversity, immigration, incitement and causation (cont. ), property rights, legal and logical positivism, fraud, contracts and inalienability, self-ownership, creation and the source of rights, and common libertarian misconceptions and mistakes such as scarcity vs. nonrivalry, states’ rights, loser-pays system, an educational voucher system, push the button hypos, rights as a subset of morals, spam as aggression, the danger of metaphors and equivocation, working for the state, shrinkwrap, clickwrap, and fine print in contracts, federalism, left vs. rights, activism, use of courts, forgiving crimes, abandoned property, fractional reserve banking, inalienability/voluntary slavery, mutualism, relevant technological unit, the Lockean proviso, the Blockean proviso, Rothbard on copyright, Constitutional sentimentalism, Georgism, strategy, thick vs. thin, and other issues. Slides for this lecture are appended below (also used for lecture 6).